I was recently talking with a debut novelist who was advised by someone in the publishing industry that a Facebook author page would be OK to use instead of creating an author website. I’ve occasionally been asked by authors at conferences: Why not just use Facebook? Isn’t that where everyone is spending their time already? Why would people visit my site? Why bother with all the effort of establishing a site, which, if it becomes dusty or out-of-date, could be more damaging than no website at all? First, I’ll address why it’s a bad idea to use Facebook as a substitute for your author website. 1. People may leave Facebook. I remember the very first fan page I created for Writer’s Digest—and it wasn’t on Facebook or Twitter. It was on MySpace. Guess how many people visit that page now? It may be hard to envision, but Facebook may eventually lose favor. Another platform may become more popular, or it may be an entirely new site or technology not created yet. It’s impossible to predict. But by choosing Facebook instead of an author website, you are favoring the short-term over the long-term. You are investing your time and energy in a platform that may not pay you back in several years’ time. Maybe it benefits your current campaign or initiative—but you can never be sure it’s going to benefit your second or third project. In the meantime, your author website remains undone, and people who don’t use Facebook become incredibly difficult to identify and reach. 2. Facebook is not under your control. This is pointing out the obvious, but authors don’t take it seriously enough. You can never control what Facebook does—with its design, with its user interface, with your likes/followers, with its functionality, with its ad displays. You’re limited in how you can optimize the experience, and your insights (metrics) are limited to what Facebook itself measures and decides to pass onto you. Many people and businesses received a rude awakening when Facebook adjusted its algorithms so that only the most popular status updates would be seen by most fans of a page. If you want to reach ALL fans who’ve liked your page, you now have to start paying money. That said, it’s true that a site with 1 billion users has attractive qualities to anyone building an online presence. I’m not saying ignore Facebook, but realize you don’t call the shots. 3. A website is the most effective way to deliver information to your audience. A reader finishes your book, loves it, and wants to see if you have any book club materials, readings or events, or other opportunities to enrich the experience they’ve just had. They Google your book title. What do they find? A reader finishes your book, loves it, and wants to find other things you’ve written. That reader may explore Amazon, go back to Google and search for your author page, or find your Facebook page. Will they be able to find what they’re looking for? Someone in the media hears about your book and wants to contact you. They run a Google search. What do they find? A conference organizer reads your book and thinks you’d make a great speaker. They run a Google search. What do they find? You probably see the common thread here. When people seek information, they often go to Google to search for it. People won’t be inclined to visit Facebook when they have a specific goal or information they’re seeking. Why? Because Facebook is a soft connection tool, for people to stay in touch in a very organic way. It’s not about structured information delivery, but conversation and social engagement. A website, on the other hand, serves as a hub for all people who are interested in your work and are seeking more information or updates directly from you. It doesn’t matter if they heard about you online or offline, people are trained to use their mobiles, tablets, and desktops to search for more information, and your author website is a 24/7 resource waiting for them. Making your other online efforts more effective—or making people aware of all the places you’re active. For instance, the No. 1 way people find out about me on Facebook (and end up subscribing to my feed) is because they’ve visited my website or read my blog. Offering many ways for your fans to engage. Aside from having an e-mail newsletter, you may offer ancillary materials that fans would enjoy, such as additional chapters, resources, book club materials, etc. But isn’t a bad website worse than no website at all? It actually takes effort these days to have a bad website, given today’s website building tools such as WordPress. I also have to wonder why your website would be out-of-date or damaging to your career if you continue to write and publish. The only reason I can imagine is if you had a website built in the way it was done 10 years ago, when you needed a web developer or programmer to be the “webmaster.” Today, if you create a new website, it should be done in such a way that it’s easy for YOU the author to maintain and update—no more difficult than if you were updating a Word document. Sure, you may need to spend a couple hundred dollars every year or two for a developer to assist with a redesign or functionality add-ons. But for anyone with a long-term author career, this is one of the best and most critical investments you can make. Posted in Digital Media, Marketing & Promotion and tagged book marketing and promotion, Facebook marketing, websites. 4. Perception. People expect you to have a website as a professional author… THEN a Facebook, Twitter, etc… if you’re not on the web as your own entity first, credibility suffers. Indeed, transferring content from one environment to another is always a sticky business. Whatever platform one uses for a website, hopefully it’s something that has a strong, usable export function! Item 1. There’s no guarantee that WordPress or any other platform will endure. However, I really do agree with you on all the other points you mention. FB is for fun. An author website is for serious work. Besides there is no reason why a person can’t use FB to guide people to their serious website. That has worked amazingly well for my personal blog, even though the blog is not an author website. Very true re: WordPress. It undoubtedly has a shelf-life like any other tech. That said, it powers 20% of websites in existence and is open source, so if you want a website that’s not owned/controlled by someone else, it’s tough to find a better option. I should also clarify that I’m not against activity or engagement on Facebook. Nor do I think you must choose an activity like blogging over Facebook updates/engagement. Rather, it’s about what you consider home base. There’s no guarantee that WordPress or any other platform will endure. That’s not true. WordPress is free, open source software—as you long as you care to run it on your server, it will endure, and there’s nothing that anybody can do about that. Facebook, on the other hand, will endure only so long as its owners decide that it should continue to exist. If you run WordPress on your own site, as opposed to getting a free one through wordpress.com, you’ll still have your site if the mothership goes down. Also, if you do decide to register your own domain name and then point it to a self-hosted WordPress instance, if WP ever does die or something better becomes the dominant platform, you can always migrate your old content to the new software in the same place. And one of the components of Google PageRank is how long your domain has been registered, so keeping the same hostname registered is important. Great tips on why a website is valuable. I’ll definitely create one if I ever sell a book. Here’s a question: Does a Blogger site–which is set up essentially as a website and a blog–count? There are so many tools I haven’t explored, but it seems like a one-stop way to engage readers and offer current info. Or do we need a dedicated website AND a blog? Blogger, lets you create static pages, as well as dynamic (blog) pages so you have all you need right there. Blogger has been around for a long time, but is ultimately subject to the whims of Google, so I prefer hosted WordPress for that and many other reasons. I agree with everything Mary Ann has said below. A Blogger site counts as a website and is an easy way to get started, especially since it allows for static pages. The big drawback is that if you don’t intend to blog, Blogger doesn’t make much sense as a way to get started. In an ideal world, your website & blog are under the same domain (as it is here, with my own site). Yes, a blogger site “counts” and is a great platform to use, just make sure to add your own custom domain to it! I know authors who have started and stayed on blogger and do just fine. The principle still stands: have a place to call your own. I appreciated this post. When my debut MG sold last year, I put part of my advance money into having a professional website designed. It came out beautifully, but is somewhat expensive to maintain. I’ve made a personal choice not to be on FB, but instead to continue trying various ways to draw traffic to my site. Thanks for confirming the importance of a good author site. Thanks for commenting, Dianna. Sorry to hear that the site is expensive to maintain. Is it built on WordPress or some other system? Yes, I have a similar attitude toward FB content. I don’t value it that highly. The nice thing about WordPress is that it’s flexible. If you don’t want a blog, you don’t have to have one. You can have static pages where you put your book information up and links to excerpts and other goodies. In fact, that can be the bare minimum of an author’s website. When I read about a new book, I’ll google that author’s name and look in particular for book excerpts. Anything else — a snazzy design, QnA’s with the author, and other goodies — is just gravy. You’ve left out the biggest reason of all: EdgeRank. 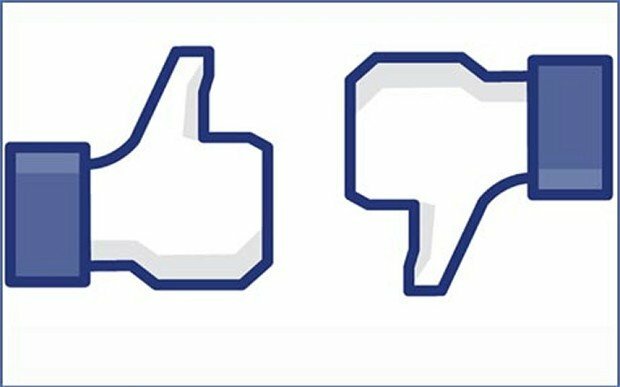 EdgeRank, Facebook’s algorithm to determine what people see if their feed, will cause ~70%+ of the people who have Liked you to miss your updates. Yes. I alluded to that briefly under #2. Yes, excellent reasons. As I said under #1, by relying on FB, you’re missing out on that percentage of your audience that doesn’t use it or like it. You’re OK sticking with Blogger, though I recommend you be prepared to eventually change platforms. You never know if Google might shut down the service, as they did with Google Reader. Very interesting! With my first novel coming out in January 2014, this is a topic that is important to me. I’ve been urged to have the dual presence in FB and Website (Blog) and I can see how having both is preferable to just one. Your reasons under #3 are the most compelling for me: what do people get when they search… It makes me curious: do you think that FB will start showing up in Google results more prominently as people use FB as a business (including writing) platform? IMHO, I think Facebook has peaked in the US market and will not become more influential than it already is right now (whether in Google results or in other ways). So true–all of it. I’m so aware each day what a lack of control I have over Facebook. It’s nice to have complete control over your own website. It really is. I agree, Jane. This is especially for true for children’s authors. Their readers may not even be on Facebook yet. And the Facebook page is limiting. If you want to provide an interactive experience, FB shouldn’t be an author’s only option. are you using the terms wordpress blog and website interchangeably? WordPress is a content management system that allows you to incorporate a blog (or blogging functionality). So, your WordPress site can act as a blog, or as a static website, or it can be both (as is the case with my own site right here). Call me a dummy. I signed up for the webinar, then mixed up time conversions and missed it. I thought there was some place I could find a transcript online? Do you have any suggestions for a dummy like me? So sorry to hear that! You’ll automatically be sent the recording and Q&A, just like everyone else. The e-mail usually goes out within 1 week of the live session, so keep an eye out. When I review a book I try and post a link to the author’s website or blog. But I want it to be their website – http://www.authors name.whatever. Not their Facebook page. Yet I still get a few authors (indie and trade published) where I can’t find a website via Google. No matter. No obvious website, no link. I believe the social media’s biggest role is to bring more visitors to your own website. Great info! I’m doing some research on author websites because I’m considering going into the niche of website design for authors. I haven’t decided 100% for sure though. I will say this, though. Yes, WordPress CAN be easy to maintain, but I’ve had clients in the past that, even after training them on WordPress, for whatever reason, don’t maintain it and the site gets hacked, etc. That’s why I offer maintenance plans for the sites I do, because apparently some don’t want to be bothered with maintaining it, even when it’s pretty easy. Longtime WP dev, so yes I have that bias. I despise FB mainly from an aesthetic POV but I also think it’s just a social-chat-a-chat-chat thing. Pics of my cat! Here’s a selfie! All that. YMMV, of course, but I’m taking my chances and staying invisible with my website(s).